Looking for ways to prevent your front door from being kicked in? According to the FBI there are a little over 1 million home invasions and burglaries every year. With most of those occurring during the day between the hours of 10am and 3pm, when most people are away at work or school. However, they can and do occur at any time of the day. Luckily, there are steps you can take to reinforce your exterior front door and stop or prevent potential break-ins. You can get a 2.25" thick, wood veneered, steel reinforced door with 16 locking bolts. They sound very secure, unfortunately, these doors start at $6,500. Who can or wants to spend that much on a door? And, while no one can put a price on the safety and security of your family and home, thankfully there are less expensive ways to improve the security and reinforcement of your door. These door jamb armor kits from Armor Concepts reinforce your existing front door and frame. The Door Max Combo Plus kit comes with a jamb shield, pry shield, hinge shield and 2 door shields – 1 for the latch and 1 for the deadbolt. The shields are barely visible once installed and they come in three different colors – satin nickel, aged bronze and white. They also have kits for doors on mobile homes and doors with sidelites. These work by reinforcing the weak points of your door and frame, preventing kick ins from physical force. The pry shields are screwed onto the door and frame, takes about 30 minutes to install and you do not need to remove your door to install these shields. A metal door, like this one from Steves & Sons, is just as strong as a solid wood door but at less than half the cost. It is galvanized to prevent rust and helps to decrease maintenance. I used to have a solid wood door, it was beautiful but the upkeep – the sanding and staining – every two years was daunting. It can be primed and ready to be painted. It has a polystyrene core for energy efficiency. This one comes pre-drilled for a deadbolt and lever set with a 2 3/8" backset. Deadbolts come in 3 grades, grades 1, 2 & 3, and grade 1 is the one you want. Grade 1 bolts can take the most abuse and the bolt is longer, thereby putting more of the bolt into the door frame. Grade 1 deadbolts are harder to pick, more difficult to be "bumped" and take longer to drill through. Because a new deadbolt will fit into the existing deadbolt cutout, these also are easy to install. Medeco deadbolts are the most secure residential deadbolt available and can be installed in a standard door cutout in minutes. Most deadbolts tout themselves as bump and pick "resistant", the Medeco deadbolt is bump and lock proof. Only an authorized locksmith can remake a key for this lock. That may seem inconvenient, but that decreases the ease with which your key can be remade. This deadbolt costs $139.60 on Amazon but it is the highest rated and most secure conventional deadbolt you can buy. Sometimes referred to as a "blind" deadbolt because it is only visible from the interior side of the door. This deadbolt has only a thumbturn on the interior and can only be locked and unlocked by those on the inside. And because there is no keyway visible to the exterior it cannot be picked or tampered with. Some states require apartments to have these on their front entry and balcony doors. The one-sided deadbolts are more secure and harder to defeat than most other additional lock mechanisms such as door chain locks or swing bar door locks. If you don’t want to go all out and add reinforcement plates to the entire door assembly, you can add this latch strike reinforcement plate. It attaches all the way to the wood studs with the included 3" long screws. This replaces your existing separate latch and deadbolt strikes. Besides the deadbolt, it is probably the easiest of all the things on this list to install yourself. The holes on this are for latch and deadbolt holes that are 5 1/2" to 6" on center. You might have to look elsewhere if this is not the dimensions you have. Most door frames are made of wood and if you’ve seen pictures of kicked in doors the frame is usually the weakest part. A metal frame will help to prevent that. Wood frames are usually 1" thick or less and when kicked in is the part that gets broken first. A metal frame can be galvanized and primed to be painted to match the door or color of the house. See picture at right. Door is intact but the wood frame breaks. A metal frame is probably not feasible for homes with an existing front entry door. That would involve removing and replacing, which can be done but you would probably need to involve a contractor. This option is probably better suited for those that are in the process of building a house. Doors that have windows look great but are not great for security. Glass is easily broken. And it is much easier to get in if you have a deadbolt or lock that can be unlocked with a flip of the thumbturn. If you are set on getting a door with a window you should get a double cylinder deadbolt, which is a deadbolt that needs to be opened from inside with a key. Potential intruders won’t be able to reach in and unlock the door, even if the window is broken. There are deadbolts that can be unlocked by access code and you do not need a physical key. And because it does not use a key it cannot be picked or bumped, preventing breaking in using those methods. A fairly inexpensive one is the Yale Security deadbolt lock. It is a grade 2 deadbolt and runs on 4 AA batteries. It has a pushbutton keypad for you to enter the code and will store up to 25 different codes. If the batteries run out you can use a 9 volt battery to give it power long enough for you to enter. Just about any doorbell camera has video capabilities. But you need one that will send you a notification when it detects movement so you can monitor the video feed even if the doorbell isn’t pressed. Most times, if someone is going to break in they look through the windows to see if someone is home. If the doorbell camera does notify you, it will allow you to talk to them through the speaker as though you are home. 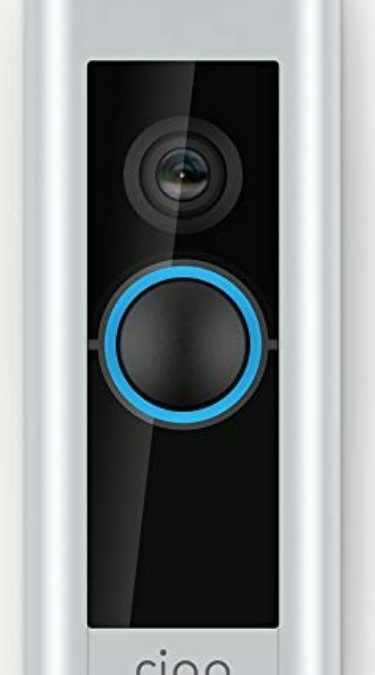 The best one for this at the best price is the Skybell HD Wifi Video Doorbell. It works with Alexa and Google Home devices. The reason I like this one is it is only $199.99 at Amazon and you can access all your camera video from the cloud for the last 7 days without a subscription. You can also download any videos within that time period to save or share. Most of the other ones, like those from Ring or August, have the same capabilities but will charge$10-$30 a month for this service. You can find more information at 5 Best Doorbell Cameras. Motion activated lights, the brightest you can find, are another great deterrent. The light turns on and illuminates dark areas when the motion sensors are activated. Bad guys and critters tend to hide when there is too much light. An extra benefit to motion activated lights is they light up the walkway when your family and friends arrive. The URPOWER solar lights are inexpensive, solar powered and only $26.89 for a pack of 4. The sensing area is within 10 feet and lights up a 120 degree angle. There are more expensive motion activated lights like the $249 RING floodlight that has a camera with two-way talk and siren alarm. It requires a hard-wired connection to a weatherproof electrical box and when it senses motion will send you a notification. Even if these deter intruders at the front door, they still could try to go through a window or less reinforced door such as the back or garage door. The idea is to make your house and your door a tougher target than the one next door.